I posted this near the beginning of my web log experience, and this basic re-print is just as germane today. The major battles of the war – When I was a child in the 1960s, names like Corregidor and Iwo Jima were still sacred, and pronounced everywhere with respect. ... Today the Battle of Midway has become niche-market nostalgia material, and most children (and many adults) have never heard of it. Thus we honor "the greatest generation." The attitude of American intellectuals – such as “Our entry into the war, under the slogan of 'Stop Hitler!' would actually result in the immediate introduction of totalitarianism over here. ... The American masses can best help [the German people] by fighting at home to keep their own liberties." ... Why rake up these Profiles in Disgrace? Because in the Iraq War era they have a painfully familiar ring. The veterans’ neglected voice – World War II produced an extraordinary literature of first-person soldier narratives – most of them out of print or unknown. ... The Library of America includes two volumes on "Reporting World War II," but where are the soldiers' memoirs versus the reporters'? Next is ‘First Wave at Omaha Beach’ by S L A Marshall, one of the best-known (and official) historians of World War II and Korea, published in The Atlantic in November 1960. 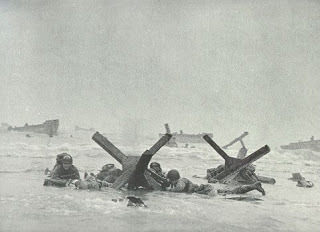 He begins by explaining how “the passing of the years and the retelling of the story have softened the horror of Omaha Beach on D Day.” This has occurred, in his opinion, by the fact that the initial reports from which the standard account had been built were based on the immediate statements of the survivors. But Marshall returned to the enormous amount of detail accumulated during the field research afterward in order to make some sort of sense of the overall magnitude of the assault (though he modestly neglects to mention that he was in charge of that research and that it began with the landing of his team while the battle was still being fought). He draws you into the story by building on the fact that Omaha Beach (one of five assault beaches, in addition to the paratroop landing zones inland) covered a two-division front landing (enormous, to the uninitiated) but only six rifle companies were relatively effective as units during the initial assault, since the others (some three times that number) had been "shattered and foundered before they could start to fight." He goes on to explain, from his faded notes, what can best be discerned about the fate of the first wave of the assault comprising Able and Baker Companies, 116th Infantry, 29th Division. Normally, I would say ‘read the whole thing’. Rather, I implore you to read it all, and I wish that if any one article on the topic could be thrust upon our atrophied and effete public education system, it should be this. Trying to excerpt some lines or paragraphs to give one the gist of the assault would be woefully inadequate. These articles should not be lost, and my thanks go to Scott Johnson for providing them. Increasingly I do not think asking young men to risk dying (once a matter of course) for an abstract ideal is going to be enough. We fight now at the whim of presidents and we don't win and so what's the point? I had a great uncle (Navy) at Omaha on the first day whose landing craft was hit by a mortar and he swam himself and his radio ashore and directed fire from such as the Battleship Texas. When his nephew (Army) came ashore on the second day he was surprised to find his uncle still alive.